The A Bird is Not a Stone family has had both good and bad news recently. With contributors from Gaza, it is sadly almost inevitable that the Palestinian poets and artists involved would be hit by the ongoing Israeli bombardment, shelling and invasion which has killed hundreds so far. Poet Othman Hussein’s house in the south of Gaza has been destroyed, although thankfully he and his family survived. The same goes for the home of artist Raed Issa, who supplied the beautiful cover painting. 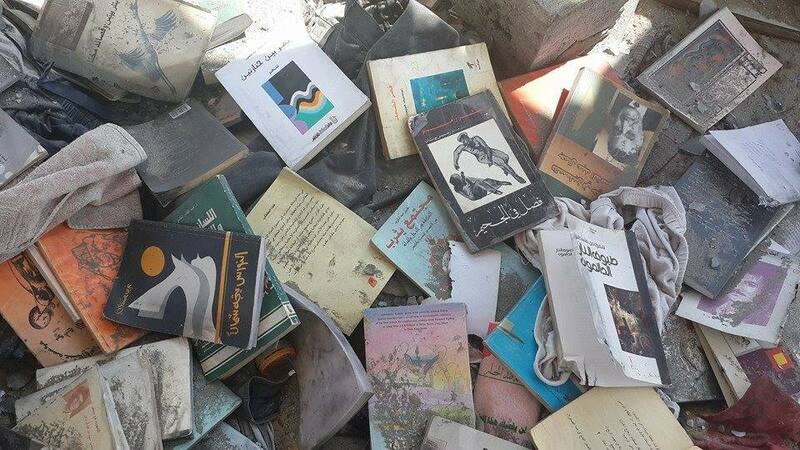 Damaged books from the destroyed home of poet Othman Hussein. It’s no consolation to those affected, of course, but two of the Scottish poets involved in A Bird is Not a Stone should also be congratulated. Harry Giles is one of the six poets to be shortlisted for the inaugural Edwin Morgan Award, a prestigious new poetry prize for Scottish artists. The winner will be announced at Edinburgh International Book Festival on August 16th. And Christine de Luca, who contributed the Shetlandic translation in the collection, has been named Edinburgh’s new Makar (roughly the equivalent of a poet laureate). We’re hoping the Christine will be reading her work from A Bird is Not a Stone alongside Maya Abu al-Hayyat at Word Power Books on August 19th.